January Is National Oatmeal Month Too! Saturday I celebrated National Soup Month with you by sharing with you a festive Chicken Tortilla Soup and some handy soup making tips. But did you know January is also National Oatmeal Month? To celebrate oatmeal I will be featuring my first “Week of…” series for the new year. Every day this week I will share with you some ‘heart healthy’ oatmeal recipes and oatmeal tips and how-to’s. Below is an article and recipe that I wrote for Food on the Table. Hope you enjoy and you will come back and celebrate oatmeal all week! Did you know January is National Oatmeal Month? Oatmeal is an excellent source of many essential vitamins and nutrients such as Vitamin B, Vitamin E, calcium, magnesium, zinc, and phosphorus. Oatmeal is also full of insoluble and soluble fiber. Studies have shown that because oatmeal is loaded with these vitamins, nutrients and is full of fiber, it can help fight heart disease, lower cholesterol, and help maintain blood sugar levels as well as maintaining the metabolism. Not only does oatmeal have great health benefits, it extremely affordable and versatile. It is great cooked for breakfast and topped with some fruit and honey, or made into a classic after school snack of oatmeal raisin cookies. But have you ever thought about cooking with oatmeal? Since oatmeal is a pantry staple I often use it in cooking. A small container of bread crumbs is about the same price as a large canister of oatmeal. Oatmeal is a great ingredient to use in place of bread crumbs in recipes such as meatloaf, meatballs, and hamburgers. I will also often take oatmeal and blend it up in a food processor to use it to ‘bread’ chicken cutlets. So if you are looking to eat healthy and on a budget, remember that canister of oatmeal sitting in your pantry and cook up something good to eat! 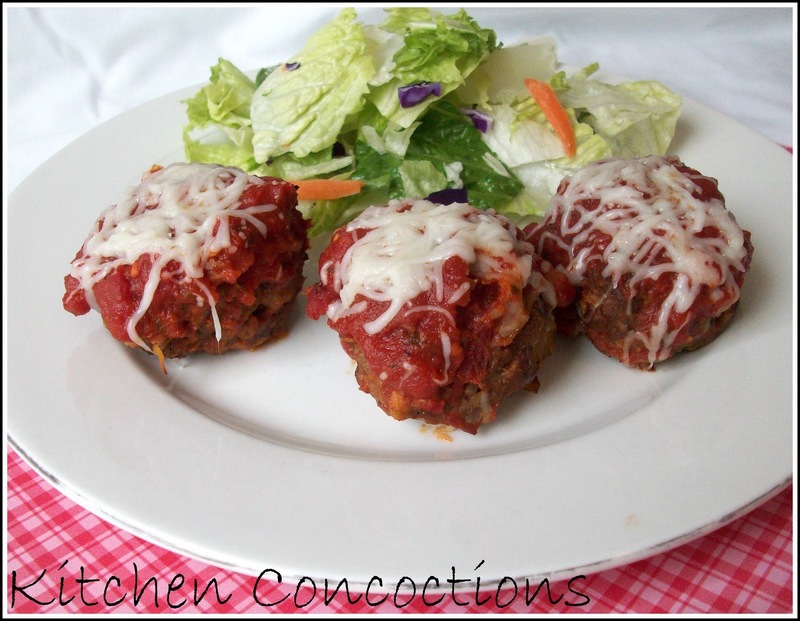 In honor of National Oatmeal Month, try making my Italian Meatballs! The meatballs use oatmeal as the binding agent instead of bread crumbs. They are full of flavor, are ready in no time, and use ingredients that I always have on hand. Try them on hoagie rolls for meatball subs, or over a bowl of pasta, or my favorite way to eat them is just by themselves with a simple side salad. Yum! In a large bowl combine ground beef, oats, egg, Italian seasoning, salt, pepper, and 1/3 cup marinara sauce. Heat olive oil in a small sauce pan over medium heat. Add onion and cook for 3 to 4 minutes. Add garlic and let cook 1 to 2 minutes more. Let onions/garlic mixture cool slightly and add to ground beef mixture and mix together. Shape meat mixture into 12 to 14 large golf ball sized balls. Place meatballs in a 9×13 pan. Bake in preheated 350 degree oven for 20 minutes. Remove meatballs from oven. Top each meatball with 1 to 2 tablespoons marinara sauce. Place meatballs back in oven and cook for 8 minutes more. Remove meatballs from oven. 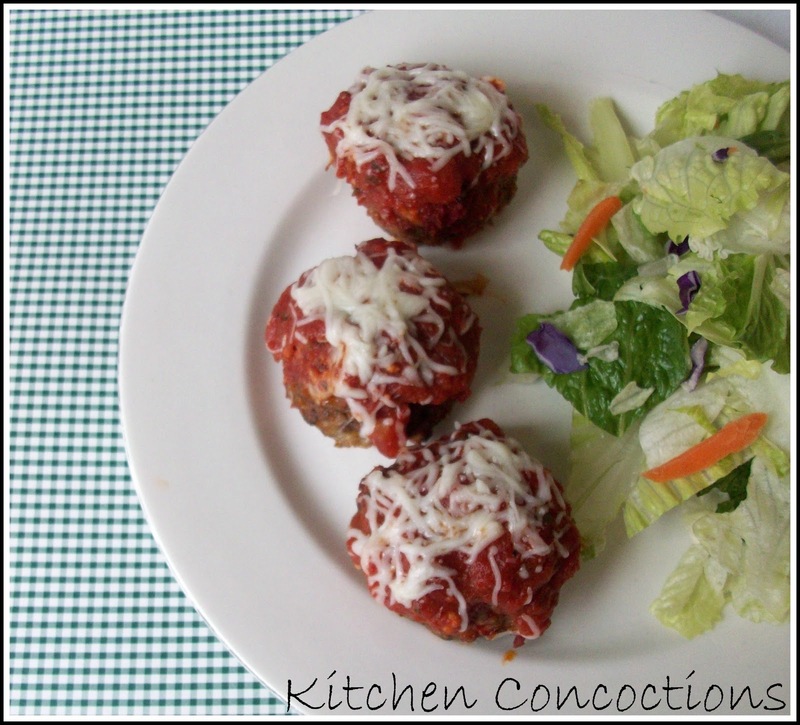 Top each meatball with 1/2 tablespoon mozzarella cheese. Place meatballs back in oven for 1 to 2 minutes to melt cheese. Serve with additional warmed marinara sauce. These meatballs are great by themselves or served over pasta, or served on a hoagie as a meatball sub! « Happy National Soup Month!